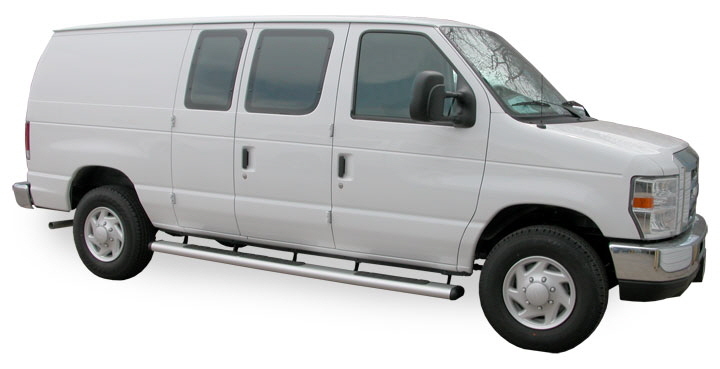 2003 - 2019 Chevy Express & GMC Savana 155" wheelbase van O-Mega II long/long Aluminum step set. Each set includes one 114 inch step for the driver's side and one 114 inch step for the passenger side. Also includes mounting brackets and instructions. Steps have molded tread inserts. Choose satin anodized or black anodized finish. Not for Chevy City Express. Ships truck freight to commercial address only. Not for 135" wheelbase vans. Fits 2003 - 2019 Chevy Express & GMC Savana - all van body models with 155" wheelbase. Fits 1500, 2500 & 3500. No drilling required.